A new DA has been submitted for a new mixed use development located at 352-364 Vulture Street, Kangaroo Point known as Piazza. 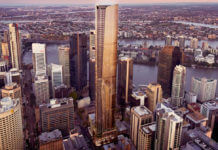 Designed by dwp|suters, the proposal has a maximum building height of 20-21 storeys, with two towers (north-eastern and north-western) including multiple dwelling uses and the third tower (southern) comprising short-term accommodation and hotel uses. Ground and podium space includes a range of activities focused around a central piazza, which provides a publicly accessible space within the site. A total of 298 apartments are proposed. 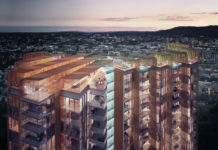 The southern tower includes 204 short-term accommodation apartments, of which 187 will operate as part of a dual key arrangement comprising studio and 1 bedroom components. According to the DA, the Hotel is located at the southern Vulture St side of the site. The top floor of the Hotel includes the guest pool, restaurant, bar, functions rooms and rooftop dining. An observation deck is located at the very corner of Main and Vulture Streets. The tower is a podium form at the lower two storeys and then a glazed curtain wall form up to the top pool and restaurant story. The curtain wall is predominantly a dark tinted glass with a random grey/green fritted glazing panels. The roof is a variation of the residential tower roofs but styled to suit the hotel mass. Good for architecture and proximity to transportation (Woolloongabba Busway Station).